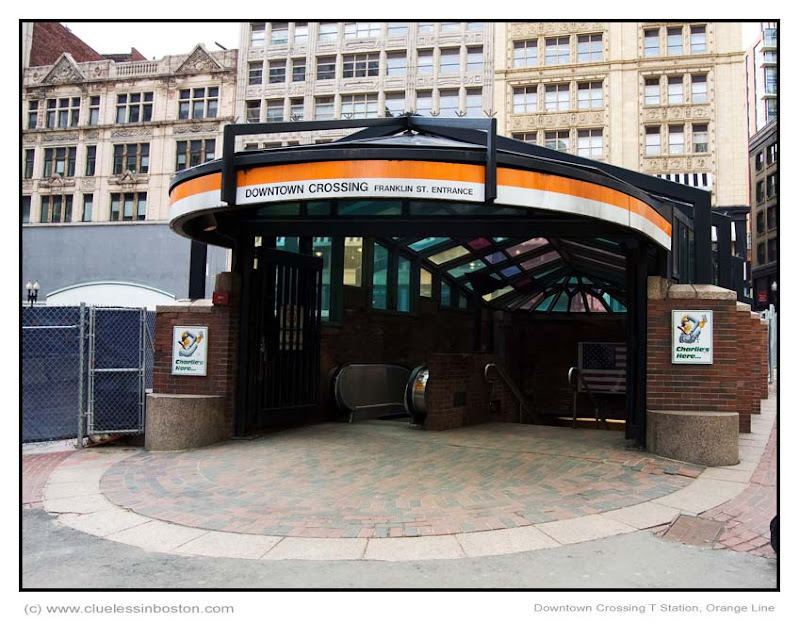 Downtown Crossing Orange Line train station entrance on Franklin Street. This entrance is directly beside the old Filene's, now a big hole in the ground. I love the way you've composed this with the curved lines of the entrance reaching out to the viewer, welcoming us in. I would like so much to visit Boston someday!This city seems so beautiful, modern, clean and full of culture! At least twice now you have mentioned the big hole where Filene's used to be. What is supposed to be built there? Would the Arthur Fiedler sculpture in the Esplanade photograph well? I really enjoy your photos. Merci. Nicely composed - great lines and color! That is such a pretty entrance. Wish our train stations were just as aesthetically pleasing. The orange really pops out here.